New Brand for It's 5 O'Clock Somewhere Distillery — Blind Renaissance, Inc. It's 5 O'clock Somewhere Distillery is located in Cashmere, WA and was looking to expand their market and develop a new brand for their line of hand crafted spirits. BR completely overhauled the brand which then lead to a new identity, product label designs, and a brand new website. 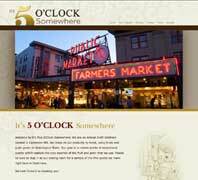 Visit It's 5 O'clock Somewhere Distillery's new website to view their list of products as well as some tasty recipes.